(n. d.)	· Honolulu, H.I. Honolulu, H.I. : Published by Wall, Nichols Co., Ltd, (n. d.). Ca early 1900s. All housed in s blue cloth double-section slipcase. Outer case with a 3 of Clubs card affixed, opposite side with gilt stamped title lettering. Cards - Nr Fine. Case - modest extremity wear, spot showing price sticker shadow - VG to VG+.. 52 playing cards, plus Joker & publisher advert card. 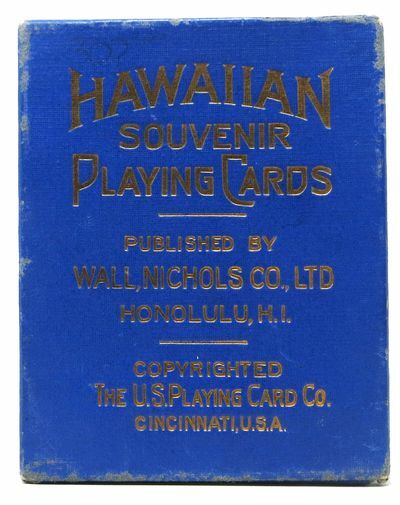 Each card illustrated, on the playing side, with a captioned oval scene depicting some aspect of the Hawaiian Islands. AEG. Cards: 3-7/16" x 2-3/8"